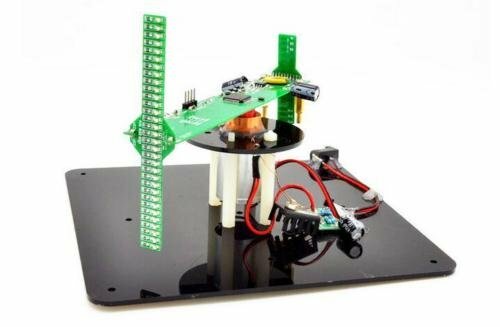 New version of Biaxial 3D Rotating LED kit. 1. Part of rotary plate are using wireless power supply, rotating noise greatly reduced. 2. Display part using bright 0805 monochrome LED, the system power supply voltage is 5V1A, rotating motherboard using STC microcontroller IAP15W4K61S4 control. 3. Clock chip using DS1302 comes with backup battery. 4. Support the remote control to adjust the time. 5. Remote control can switch a variety of display modes, to provide some open source C program, suitable for learning purposes. 6. Using 5V external power supply, matching USB power cable can be connected to 5V power supply such as the computer USB port, mobile phone charger, rechargeable, etc., but also DIY battery power: use four 1.5V dry battery series power supply or use two 3.7 V lithium battery in series! 7. Can send text, pictures, gif animation, calibration time through the host computer, the host computer software supports Chinese and English input. 2 sets of text can store a total of 850 Chinese or English characters! Monochrome text display! Can store 30 pieces of 32 pixels wide * long (10-200 pixels of the white background and black text monochrome image), and a group of up to 20 pictures composed of simple gif animation, using high-performance motor FR370, the speed is high enough to make the display stable.